When it comes to mp3 files, you sometimes may need a set of tools to edit, convert or even rip them in first place. While you can use specialized tools for that which provide you with some of the functionality that you may need, a set of tools that Mp3 Toolkit offers may come in handy as well. 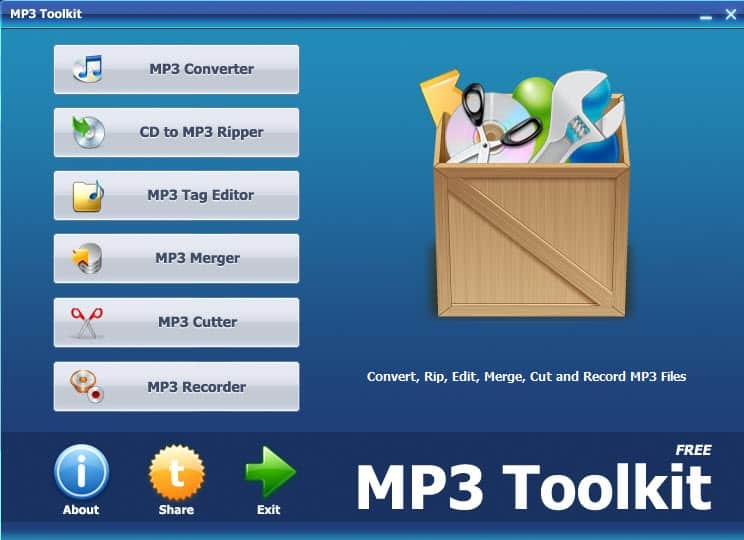 MP3 Converter - Convert various audio formats into mp3, or another selected audio format. You can add single audio files or convert all files inside a folder at once. Conversion options include selecting the bitrate, rate and audio channel settings for the output files. CD to MP3 Ripper - Insert an audio CD into the computer's optical drive to have it converted to mp3 audio files. MP3 Tag Editor - A convenient tag editor that offers a lot when it comes to mp3 tags. You can use it to edit tags manually, remove non-ID3 tags, synchronize tags, copy information between ID3 tag formats, or clean tags. What it does not offer however is an option to retrieve tag information from an Internet music database. MP3 Merger - You can use this module to join multiple mp3 files. MP3 Cutter - Cut parts of an mp3 file. Comes with options to save as a ringtone. MP3 Recorder - Will record system sounds. There is unfortunately no option to select an audio source here. The program can be quite useful, even though you may find that specialized tools like CDex, The Crab or Audacity have more to offer in terms of functionality. Still, for basic tasks this may be all that you need after all. All modules MP3 Toolkit ships with are easy to use, which is definitely the biggest advantage besides the fact that it is a tools collection and not a single-purpose program. Wow! Looks promising. Thanks for posting this! I wondered if there is anything like this for .wav files. Mines are so messed up and I can’t find a single program who gets the right info for my music. ( I know I listen to very uncommon groups, but still). I rip all my music in the wave format since I want lossless uncompressed sound. I don’t really care how large my files will be, however I ripped it with windows media player and it messed up all the meta information. Since 5 month or so it’s not free anymore. Latest build is 1.0.4., last free build is 1.0.3. build 1.0.4 charges 32.07 EUR actually. I don’t have seen any information or announcement or anything that they commercialized it. Also, there are no changes in the new build, only that you have to pay for it. Bad decision, bad taste. Lewis, is the limitation kicking in after a certain trial period? I have downloaded the latest version and was able to use it without registration. well, directly after start you will have the red link on the right above the MP3 Toolkit logo “Unregistered, Click Here to Register Now!” link. Let’s say you try to use MP3 Converter, drag&drop 5 MP3s into it and convert them, after finish only 10 seconds have been converted and a pop-up comes with “Before Registration, Converter will only convert 50% music. Register Now?” Looks like MP3 Converter is the only restricted part of the Toolset.